Year 2018 would brand Victory Venkatesh as the busy person in the Tollywood circle. He would be omnipresent throughout the year as the Chanti hero would be working in as many as 4 movies. In his 3-decade-old career, Venkatesh has featured in 71 movies which roughly breaks it up to 2-3 movies per year. But year 2018 will be quite huge for Daggubati fans as the handsome hunk would be filming for 4 movies at a stretch. Though no other details such as the technical team, casting, story etc., are finalized, an announcement has been made and a couple of movies have initiated the pre-production work as well. 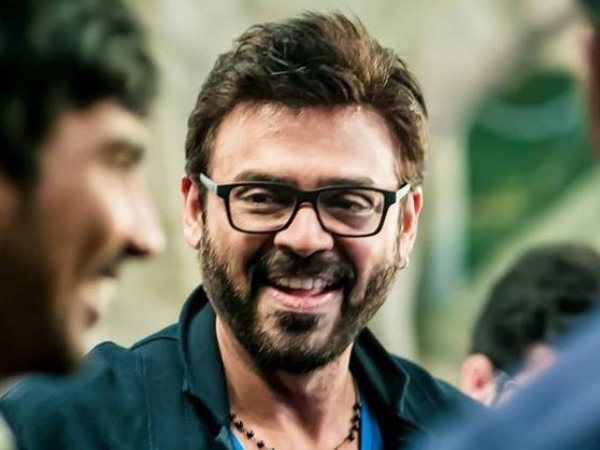 Venkatesh would be joining hands with Bommarillu fame, Bhaskar. Bhaskar, who rose to instant fame and stardom with his debut venture, looked promising with his follow-up venture, Parugu. However, the young director failed to sustain the momentum as he hit the ground with three successive failures. This yet to be titled movie with Venkatesh will be treated as a comeback vehicle for the determined director. The flamboyant director who has churned out some terrific blockbusters such as Chitram, Nuvvu Nenu and Jayam, will now be collaborating with the Venkatesh. It was just few months ago where Teja had called action-cut for the Daggubati junior, Rana. Teja’s taking and Venkatesh’s uber cool styling and body language will be some real treat to watch out for. Hat-trick director Anil Ravipudi, who is basking in the success glory of Raja the Great, will be eyeing to strike four in a row. Anil has directed one hero each from the Nandamuri and Mega family whilst he is all set to direct Venkatesh, and thus covering the Daggubati clan as well. Touted to be a commercial cinema, Anil Ravipudi has the art of combining a good amount of humour in his script which indeed will be effortlessly delivered by Victory Venkatesh. Save the best for the last. Venkatesh, who is seen as a family hero, will be tagging along with the director who owns the said genre, Trivikram Srinivas. Trivikram is now busy wrapping up Pawan Kalyan’s movie which will be followed by a movie with Jr. NTR. The Venkatesh-Trivikram combo flick will take off once the magical director concludes both his commitments. Rumours are abuzz that Venkatesh is said to be playing a special cameo in the Pawan Kalyan-Trivikram movie. If that is to come true, then we would not just be witnessing Venkatesh in 4 movies, but rather be shelling out money five times to watch him in theatres. Up Next: Agnyathavaasi Audio Launch: Here’re The Details!